The 2018 Toyota C-HR is the new addition to the Toyota vehicle lineup. This model is constructed with a forward-thinking design and sleek features. Dubbed the "Coupe-High Rise," this model is ready to take on the road. The sporty hatchback design is both stylish and functional. Adaptable and highly utilitarian, the C-HR is a great pick for adventurers and urban dwellers. It has high-achieving performance a masterfully crafted surfaces. Built to be driver-centered and fun to drive, the 2018 Toyota C-HR is ready to take you farther. This new model is filled with versatility so it is ready for any adventure or task. Seating five passengers, it gives you the ability to configure the interior of the vehicle to accommodate different types of cargo when necessary. 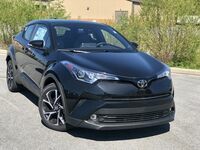 With agile handling and enough acceleration power to excite, the 2018 Toyota C-HR is a great choice for your next lease. When you lease, you gain a ton of benefits. Leasing is a great way to get into a new model without the commitment of buying. Leasing lets you beat the depreciation curve and skip the hassle of trade-ins and remaining balances. This way, you can stay up to date in the automotive market and renew your vehicle more often. Generally, lease terms will be shorter than the time that you would own a car and you normally pay less for a lease than a new car. Leasing is a great option for those that want more flexibility than buying traditionally lends. The 2018 Toyota C-HR comes in two trim levels: the XLE and the XLE Premium. In the 2018 Toyota C-HR, you will have access to a 2.0-liter 4-cylinder engine capable of producing 144 horsepower. Toyota's active safety suite, Toyota Safety Sense™ P (TSS-P) comes standard on all 2018 Toyota C-HR models. The 2018 Toyota C-HR is built to be comfortable and convenient for drivers with spacious seating and soft touch materials. Standard features on this vehicle include Sport fabric-trimmed seating, a 7-inch touch screen, and more! The 2018 Toyota C-HR can achieve 27 city/31 highway mpg*.